What your money can’t buy! Dough, moolah, smackers, all that cash. Throughout the years we coined many terms to describe money. And throughout the years we invented many ways to chase after it. Working 9-5, toiling away in the office, slaving away on the field, killing ourselves with chemicals and polluting our atmosphere with greenhouse gases. Man has believed and bought the illusion he created. We are a world of delusional people. No longer happy, always in search for something to fill a void created by our minds, we are disillusioned by what is ‘real’, what ‘matters’ and by what is fragments of our mind. But let’s be real – our world is in bad shape. Everyone knows this! All our charts are plummeting. Environmental and fresh drinking water resources, arable land, even the health performance of the people and the planet is declining. Yet we are like a hamster in a wheel. Running in circles because that’s what we are used to. Afraid that the system will break if we stop this rat race. But will it? After all, this system was created by men and functioning only because we choose to believe it. Recent studies show that food prices are rising, but our food diversity is declining. Our diets are beginning to look more alike, and the things we choose from seem more limited. Diets become more homogenised as we rely more on only a handful of crops like rice, wheat, potatoes and sugar. In fact, wheat is now a major food in 97% of countries. And local or traditional crops such as millet, rye, yams and cassava are produced and consumed less. So while we consume more calories, declining diversity is a huge concern as it makes our global food system, which is ever interconnected, less resilient to changes. Of course, money is not edible and if you look at it logically, it’s just paper. But its symbol has become the ultimate dream of a life of luxury, opportunity, fashion, respect and power. Yes – all that money, all that power, and still, it seems we got it all wrong. While money can help put food on your table, it won’t save you, or your family or the planet when mother nature changes its patterns and the fragile food system we built begins to crumble. Here is a little food for thought. Food trade has been occurring for more than 4,000 years. But it hasn’t been as connected and global as it is today. We no longer have different markets, we have one big global market. Three-fifths of the fresh produce eaten in the U.S. comes from the West Coast of Mexico, and much of the saltwater fish and shrimp comes from Mexico’s reaches of the Gulf of Mexico, Pacific Ocean and Gulf of California. Mind blowing, right? So what happens when an oil spill pollutes the waters of another country, or a natural disaster wipes out the farms of another nation? We find our own supermarket stocks dwindle and our food options decline, and no amount of money can help us change that. Time to open up our eyes and figure out ways to change this little mess we’re in. Any suggestions, any ideas? Let’s share our knowledge, whether you are a scientist, a small farmer or a child, we all can make a difference! P.S. 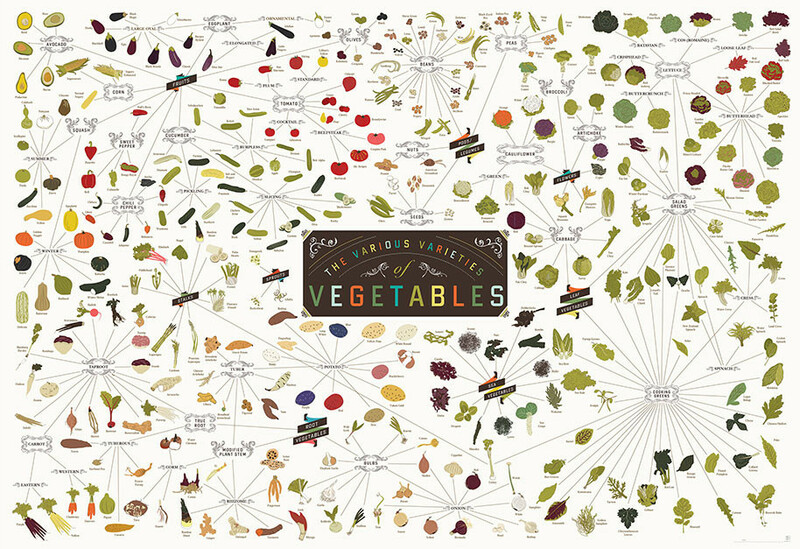 You can get this vegetable poster from here. Posted on May 19, 2014 May 19, 2014 by saynotofoodwastePosted in BlogTagged climate change, food, food diversity, innovation, money, real green.